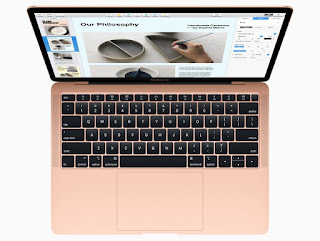 During Apples October event, the company announced a new MacBook Air, a 13-inch model with a Liquid Retina display, Touch ID, and more. The new laptop brings the MacBook Air line up to speed with features that match or surpass those in some of the other MacBook lines. The new laptop starts at $1,199 and is available for order today for delivery on November 7. Available in gold, silver and space gray, the new MacBook Air uses 100 percent recycled aluminum in its construction. That aluminum is captured during milling of casings for iPads and iPhones, then used in a specially created alloy so that no newly-mined aluminum is required in manufacture. The Retina display is similar to that used on the iPhone XR, with a display that fills nearly the entire front of the screen with just a small black bezel remaining. Apple claims “over 4 million pixels of resolution” (2560-by-1600 resolution) and up to 48 percent more color than the previous generation. Apple’s using a third-generation keyboard that’s apparently better than most with backlighting. The old trackpad has been replaced with one that’s 20% larger than the one on previous MacBook Air models, and it’s now a Force Touch trackpad for great haptic feedback. The keyboard now has Touch ID built in a key, which bodes well for future detached keyboards that might have a similar function built in. There’s no Touch Bar as on the MacBook Pro, which will be fine for many users as the Touch Bar is somewhat of an enigma to many developers and users. Powering the Touch ID is a T2 security chip that protects Touch ID info and ensures that software loaded during boot has not been tampered with. That T2 can also encrypt everything on the SSD on-the-fly, and enables Hey Siri. Powering the new MacBook Air is an 8th-generation Intel Core i5 CPU with Intel UHD graphics, and the system can now have up to 16GB of RAM. Storage is provided with SSDs up to 1.5 TB in size, perfect for those with big storage needs in a lightweight computer. The CPU is a 1.6GHz dual-core Intel Core i5 with Turbo Boost up to 3.6GHz and 4MB L3 cache. There are no faster CPU options. The new MacBook Air features a pair of Thunderbolt 3 ports for charging, fast data transfer, and connection to devices like external storage, docks, 4K/5K displays, and even eGPUs. Under wireless web use, the MacBook Air can deliver up to 12 hours of battery life. It’s 10 percent thinner than before (.61 inches at the thickest point) and weighs 2.75 pounds, losing a quarter pound off of the previous model. For the MacBook Pro, Apple is announcing that Radeon Pro Vega graphics will be available on MacBook Pro for the first time, delivering up to 60 percent faster graphics performance for video editing, 3D design and rendering. New MacBook Pro models with Radeon Pro Vega graphics will be available to order beginning November 14.